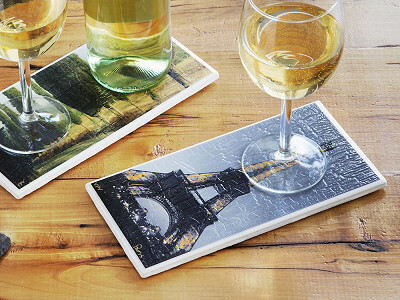 The extra-large photo coasters from Peter and Vicki Viteritti are the perfect pairing of function and art—and the perfect spot for a pair of glasses or a glass and a wine or beer bottle. The couple hand makes their coasters from start to finish in their Massachusetts home. They begin with Peter’s photographs, taken along their travels around the globe. Well-known images like the Eiffel Tower or bikes in Amsterdam are captured from Peter’s perspective, then adhered to the coasters with a unique finish that protects from condensation (and can handle hot and cold drinks). It lends a sophisticated, textured effect, too. The result of all of Peter and Vicki’s hard work is a good-looking and useful piece that works—and looks—twice as well as traditional coasters. 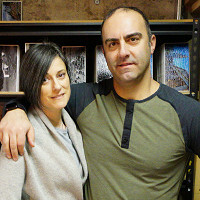 Hi everyone, My name is Vicki and I am one of the Co-Owners and Makers of VPV Coasters. I will be on hand today to answer any questions you may have. Looking forward to speaking with you! Peter and I are very excited to be launching our double coasters on the grommet today!!! If you have photos that you want can we send our photos to you and have you make them into coasters or is it just your own? @Vicki So clever and cool! Are they ceramic, pressed cardboard or something else? Wondering if heavy or breakable. Thanks and congrats on a neat product! @Kerri Hi Kerri we do custom order with a minimum of 25 coasters. Thank you so much Susan. The Double Coasters are ceramic. They are very durable but can break because it is ceramic. @Susan Like Vicki said they are made of ceramic and quite durable, but like any product made of ceramic, they can chip and break when dropped. @Kerri We can take custom orders of over 25 coasters, but we aren't set up to take custom orders on the actual product page. If that kind of bulk order interests you, I recommend emailing [email protected] and we can work out a custom order for you! @Susan I have a few of these and my toddler has dropped most on the hardwood floors. None have broken or chipped. If dropped on tile or brick, perhaps, but they have survived many a fall on hardwood and have zero markings. I am considering sending you a picture and ordering 25 coasters. What size is the image on the coster? Hi Fred! The size of the image is 4x8.25. Please email the image at the highest resolution. Also, since we need to wait for the Coasters to fully cure, the turn around time will be a minimum of ten days. @Fred That's great to hear! Make sure you send an email to [email protected] with the photo and we can help you get that started. 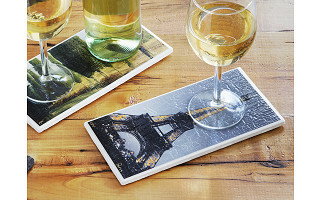 The extra-large photo coasters from Peter and Vicki Viteritti are the perfect pairing of function and art—and the perfect spot for a pair of glasses or a glass and a wine or beer bottle. The couple hand makes their coasters from start to finish in their Massachusetts home. They begin with Peter’s photographs, taken along their travels around the globe. Well-known images like the Eiffel Tower or bikes in Amsterdam are captured from Peter’s perspective, then adhered to the coasters with a unique finish that protects from condensation (and can handle hot and cold drinks). It lends a sophisticated, textured effect, too.